Heat oven to 350°F (325°F for dark or nonstick pans). Grease and lightly flour two 8- or 9-inch round cake pans. Place almonds in food processor or blender. Cover; process until almonds are finely ground. In large bowl, beat almonds and remaining cake ingredients with electric mixer on low speed 30 seconds, then on medium speed 2 minutes, scraping bowl occasionally. Pour into pans. In chilled large bowl, beat amaretto cream ingredients with electric mixer on high speed until soft peaks form. Place 1 cake layer, rounded side down, on serving plate. Spread with 1/2 cup amaretto cream; arrange sliced strawberries evenly on top. Top with second cake layer, rounded side up. Frost side and top of cake with remaining amaretto cream. Just before serving, garnish with strawberry halves. Store loosely covered in refrigerator. Instead of the amaretto liqueur in the cake batter, you can use 1 tablespoon almond extract plus enough water to equal 1/2 cup. In the amaretto cream, substitute 1 teaspoon almond extract plus 1/4 cup whipping cream for the amaretto liqueur. A food processor makes quick work of grinding the almonds. For even grinding, scrape the sides and bottom of the food processor bowl occasionally. 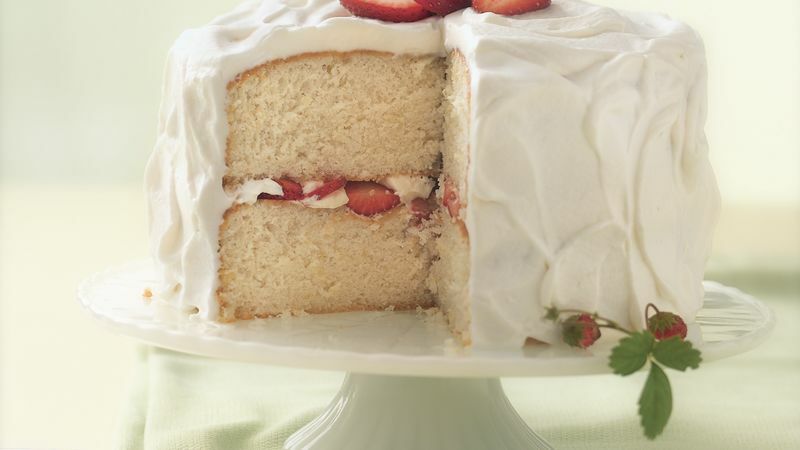 Some of the juice from the strawberry halves will soak into the frosting, so add the strawberry garnish just before serving.